Hope for Smaller Reporting Companies? Disclosure Law Group (DLG) is a different kind of law firm, focused principally on representing public companies and institutional investors in connection with extraordinary financing and related corporate transactions, and compliance with the ever changing and complex rules and regulations governing SEC reporting and disclosure. And without the overhead and infrastructure of a large law firm, DLG is able to provide its clients with exceptional counsel at a fraction of the cost typically charged by most traditional corporate law firms. 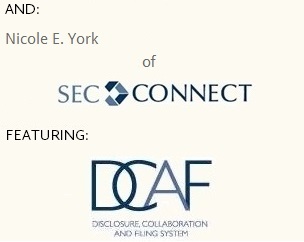 Because of DLG's relationship with SEC Connect, LLC, DLG is able to provide EDGAR/XBRL filing services as well as access to SEC Connect’s Disclosure, Collaboration and Filing (DCAF) web-based filing system. SEC Connect is a full service-filing agent, only better. SEC Connect eliminates all the variable fees that drive up the cost of a typical filing, by offering pricing options that are simple to understand, yet competitive with the costs offered by even the most aggressive EDGAR filing agents. SEC Connect’s client service team is the best and most attentive in the business, with extensive experience with both EDGAR and XBRL filings. And SEC Connect offers clients access to its award-winning Disclosure, Collaboration and Filing (DCAF) system – a web based filing platform revolutionizing the way law firms, public companies, reporting persons and others involved in the reporting process file documents with the SEC. 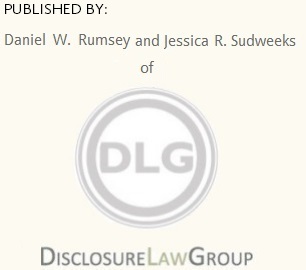 This blog is provided for general informational purposes only and no attorney-client relationship with Daniel W. Rumsey, Jessica R. Sudweeks, or Disclosure Law Group is created with you when you use the blog. By using the blog, you agree that the information on this blog does not constitute legal or other professional advice. Do not send any confidential information through the blog or by email to Daniel W. Rumsey, Jessica R. Sudweeks, or Disclosure Law Group, neither of whom or which will have any duty to keep it confidential. The blog is not a substitute for obtaining legal advice from a qualified attorney licensed in your state. The information on the blog may be changed without notice and is not guaranteed to be complete, correct or up-to-date, and may not reflect the most current legal developments. The opinions expressed on the blog are the opinions of Daniel W. Rumsey or Jessica R. Sudweeks only and not those of Disclosure Law Group. Don’t Think You Have to Worry About Timely Reporting Securities Transactions with the SEC? Think Again. The SEC Speaks – XBRL in Focus!